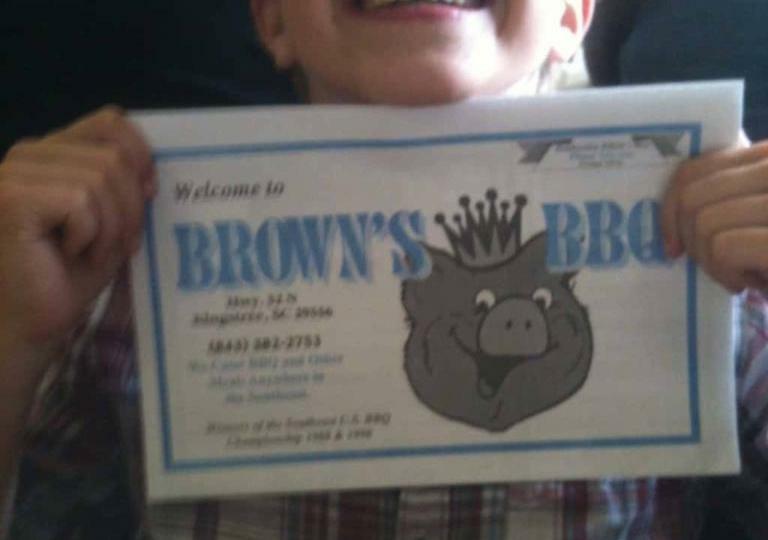 So, today, Heather suggested try some new Q, so we chose to take a ride up to Kingstree to Brown’s BBQ. I had heard great things about it from several different posts on a message board I frequent. Since it was one of the few open on a Sunday, we settled on it. We arrived about an hour before closing on Sunday (3 PM). The building sits right on Hwy 52 and is fairly nondescript, with a beige/tan exterior of concrete block construction, a dirt parking lot, and a black asphalt shingle roof. The interior is just as basic with country-themed wallpaper and few decorations. But, appearances mean nothing when it comes to good barbecue. Our first venture to Scotts proved that humble locations can provide magnificent BBQ. The buffet contained a number of choices: fried chicken, beef stew, beans, collards, rice, slaw, cornbread, and much more. We, of course, were there to try out the barbecue. They had two offerings of BBQ: pulled/chopped and ribs. We went through the buffet line, got our food and drinks and found a seat. We dug in. Camden immediately commented, “It’s a little vinegary.” Heather and I promptly agreed. The meat was tender at first bite, but frankly, we decided after a few bites that ours really seemed overcooked to the point of being “mushy” or “mealy” in texture. In the end, there really was no flavor in the BBQ other than vinegar. Mind you, I grew up in Cheraw eating vinegar-based BBQ, so the vinegar base was not the problem here. I love vinegar-based BBQ. The problem simply was that vinegar was so dominant that other layers of flavor, if there, did not come through. There was no smokiness — I believe they must cook with gas and not coals (based on the two large propane tanks in back and the complete absence of any wood stacked anywhere), however, so there would not have been any smokey layer to the BBQ. There wasn’t even really any layer of flavor within the sauce itself: no sense of sweetness or pepperiness. Nothing but vinegar-soaked, overcooked pork. They also had “ribs” on the buffet, but these certainly weren’t of the baby back nature. I put ribs in quotes because when I think of ribs, I think a full rib, like a baby back, whereas these were… short ribs, maybe? Not really sure how to describe them… maybe as a country-style rib: thick, meaty-ish, at least the piece I got. Camden also got some. Again, here, there was one dominant flavor: vinegar. Heather pointed out the ribs must have the same sauce on them as the BBQ and Camden added, “…with a lot more vinegar.” I didn’t even bother to try to finish mine. Nothing else matters if the BBQ is mediocre, but I can report that the sides were typical of any “country” buffet and of equal quality. I really enjoyed the collards. They had both good flavor and texture. Camden agreed that the mac and cheese was “delicious.” Heather noted that “the potato salad was good” and that “the lima beans and green beans were good.” She also tried the fried chicken, which she liked, “but I like fried chicken,” she said. As for the dessert bar, there was nothing there to tempt me, but I’m not big on desserts, anyway. The banana pudding was of the Jello brand, well below our standards (as Heather makes the best banana pudding around). The pecan pie was my only real temptation, but it was not alluring enough to persuade me. Camden had some strawberry cake, which he enjoyed. Heather found no dessert tempting either. The bottom line: Was it worth the trip? The unanimous answer, unfortunately, was no. Thanks for sharing, Mike. And, no, we don’t accept free food nor behave like we’re anyone special or worth trying to impress. We just go in eat, pay and leave like everyone else. Over time, I have to say I’ve begun to feel a bit bad about the harshness of the review. We were new at this at the time. Brown’s was the second place we visited. We had just eaten at Scott’s in Hemingway a few days before and that set the bar really high. Little did we know that Scott’s is among the best in the state and we were expecting a similar experience. Brown’s is well-respected in the community and has been in business a long time. That says a lot and I respect that. I have come to realize that the folks working so hard to feed us and stay in business deserve that respect, but it is only fair if we call it like we see it. It is true that we are probably “softer” now than we were then. In the end, we hope only to relate our personal experiences, good or bad, so that the reader might get an honest take – unfettered of the chains a free meal might bind us with. We do appreciate your comments and wish the good folks at Brown’s continued success. Thanks. Wow…that’s criminal in every sense of the word, especially given the quality of their product! Sorry to hear that. they have no wait staff but i left a tip on the table also but they charged my card 20 percent although i put 0.00 on the rcpt. then the management refused to correct the error. also, we took a carryout order separately and they did the same thing. What is wrong with these people?